“Like a mother hen who gathers her chicks” .. “as I am lifted up, I draw all souls unto me”. The altar and monstrance, and the priest before them, certainly lift Jesus up. And who continues to hold and present Him to us is always the one He chose: his very own mother. “Son” he said (or daughter) “behold your mother”. To avert our gaze might have seemed a distraction, but our mind moves to her who lifted Him to the adoring magi, and to the shepherds of Israel. He moves us to love her gentle hand: all is His and the Spirit’s, and comes to us through this mother and spouse. “The Lord is with thee” we may say with the angel, and the monstrance filled with Him we would kiss and hold as Mary’s cheek or mantle. To the senses this metal montage is not so warm and soft, lest it detract from Him that is our bread of life, our milk of grace. That too is as his mother will have it. To ponder His teaching presence, for here Truth is enthroned, floods our souls with incalculable light. The mind was made for truth: truth its staple food, and here is fed beyond all expectation. A suckling babe guesses no limit to its mother’s milk, and drinks until it can no more. It’s not that it draws on the source so much as the mother, like a pelican, pours forth until the sated child is asleep. In God, springs of living water “well up”within, as from an unseen boundless aquafer. Mother of Grace, put us in mind of that image so loved by Augustine. There are many noble renditions of the black Madonna, some more resplendent than others in her bedecking with the stars and galaxies as so many jewels on her breast, arms and crown. It is as if each signified the light of a soul her son has justified and glorified, making for her a gown of the night, a mantle of the deep that calls to deep, though no voice is heard. The figure of our queen mother emerges as from the starry canopy, holding in her arms its King. So too the monstrance and its light is a figure of the dancing cosmos and all the angels who minister to it. Lord, like Jacob we behold that glorious procession, angels ascending and descending, on your sacred host. We say that Mary, Christ’s mother, is the passive luminary reflecting the sun; but in truth she is full of light, full of grace and brilliance, not as a passive reflector but as an active ‘magnifier’. My soul magnifies the Lord, she simply said. As Jesus put it, ‘because I go to the Father you will do yet greater things’: things that like Mary proclaim His glory. With Mary it begins at the beginning; for in her, Jesus comes from the Father. 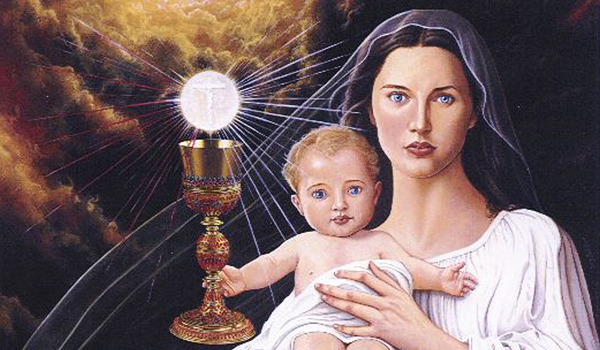 Therefore every monstrance or pyx is but our rough-hewn ersatz or avatar for the womb and the hands of Mary. O Mary conceived without sin, show unto us the fruit of thy womb, Jesus . Mary laid the boy in fodder straw, in the town of Beth- lehem (l’chayim), house of bread (or life). Jesus, staff of new Life, was longed by ages to be seen. Desert manna, supernatural in provenance, had to be gleaned after dew on hands and knees. Now without labour and cost all come to be fed; for He has become our altar “like the dew- fall”. O dew-fall from on high, quench our hungry thirst. Angels are heavenly messengers, intermediaries, guardians or epiphanic manifestations of God’s presence. We need angels in every aspect of life to administer help. But at the blessed sacrament we are in God’s presence unmediated. Angels there help us from being smitten, as I nearly was in my conversion experience before the tabernacle. But Jesus’ presence is a healing presence, a timeless elixir which guardian angels may help us to savour and digest, and its graces to preserve. He whom we greet before us is more: the very radix of human life’s sanctity. So great a mystery is found not in a question mark, but in a sliver of the bread of heaven, Heaven’s living portal laid before us by His mother and ours. Here is the real ‘centre of the universe’ - the purpose for which every visible and invisible body was made. The focus of angels who adore the Lamb of God, even those tasked to be guardians, is this apple in God’s eye: the union of God-and- man enthroned here in the flesh. Asked to express the Gospel in few words, I learned before the sacrament that human life is sacred. I might have said ‘death is overthrown’, but silence instructed that this too has its compelling reason. Confirmation came very soon after with pope John Paul’s ‘Evangelium Vitae’. The news Jesus had his disciples offer the towns they’d visit was “the kingdom of God has come near”. Near indeed: it is your very life; and here before you in the monstrance resides Life, and the very meaning of yours. When we gaze on Him we are looking on more than our death and even our second birth ‘from above’. We are contemplating Life itself, and all its sanctity. O Jesus, my life, and the life of the world, breathe in me. (Again let Him speak: “I am closer to you than hands and feet”) Lord, as your Word is, so your Spirit gives: defining even what life is. Here then in the indivisible God we peer to the heart of our reality. Even the monstrance bearing the Lord owes its continued existence to what it embraces or lifts. If this holy of holies pedestal were to dissolve and the host fall, we’d be wrong to suppose gravity had precedence: on the contrary, it is something the Lord deigns to emplace throughout the cosmos. Of it, He alone is master and ‘gravitating centre'. A quaint expression for gravity is ‘the love of masses’. The outlook of general relativity gives the centre of the world an arbitrary choice: no sun, earth, galactic centre, or outlying black hole, is preferable to another. The theory’s author quipped “the centre of the universe is here, where I place my finger”. The Lord who fashioned all does no insult to physical cosmology to add, ‘and here you find the real and purposed centre’. Jesus is the moral centre of all things, for through him everything was made, visible and invisible. He is present anywhere and everywhere, more even than the so-called quantum vacuum state of the universe, which is but one of those invisible things made. Being God he can and does choose to vest his substantive presence in the sacred host, anywhere it is confected on a Christian altar. This exalted locus is the definitive sign that “His kingdom has come”. We sometimes are at a disadvantage in reiterating the prayer of our Lord in words recorded, only because they need to receive the semiotic of the New Testament. Before His passion and death, the meaning of “thy kingdom come” was a plaintive plea or conjoined desire that this divine work be completed. On the cross our Lord said “it is finished”. At Pentecost, after His resurrection and ascension, we come into the full realization: His kingdom has come; He has conquered the world. For us the semiotic of “thy kingdom come” is, “in thy Son Jesus, King and Lord of the universe, it has come”. Enthroned before us, on whom we gaze with physical eyes and mind’s telescope, is the Lamb of God who takes away the sins of the world as John proclaimed him or “my Lord and my God” as did Thomas. If He has begun to take away the sins of the world, then resurrection of men, starting in our souls, our second birth ‘from above’, is underway. We offer an emotive therefore: “may now thy will be done throughout earth as it is in the heavens”. The physical heavens are all in order: those geysers of entropy, heat- spewing cores of galaxies, so far from disrupting it are fully engaged in the tapestry. Here below the overcoming of life by entropy learns that death is itself overthrown. The testament lies in the living Word here before us: He has died and conquered death, and is Life. What has been put in order throughout the heavens, even the invisible ranks of angels and dominions, has its Personal focus down here and now. O Holy one of God, how wonderful is your order, the first rule of heaven. This is what we mean when we say the sacred host is the moral centre of all things. The host is the effectual signifier of unity. If drawn to the Lord lifted up, all are drawn together. This gravitating centre of love forges brotherhood. Signs of contradiction are left behind when we together of one mind gaze on the same undivided host, the unblemished piece that is of a piece, the undivided body of Christ .. his Mystical body, pared out from His heart for any to partake. In one fragment is the whole. A question asked of catechumens is“for what purpose did immortal God come into the world?” The answer “to die” produces a shock of recognition, as it should. To die for us, saving us from everlasting death, is the simple answer, and we may follow it with the question “what purpose then does He have in the host which we here adore?” As I live, says the Lord: to be consumed, that you may live. This holds infinite depth. In saying “zeal for my Father’s house consumes me” Jesus means “I am on fire, and not quenched”, like the burning bush. What ‘consumes’ His attention is rapt absorption undistracted from its single - minded purpose, as a face set as flint toward Jerusalem. To Jeru-salem, Peace of the Judge, we ascend into his presence. There the light of God is unquenchable, dismissing sun or moon, for the sight is interior, like the reflective gaze of the Madonna and her son. If flinty or dark, it is because the effulgence of light would blind us. St. Augustine realized, when we consume the sacred host, it is Christ who builds us into the spiritual. He is consumed with desire to be partaken in this meal: a communion that incorporates us in Him. To eat of the physical is to work it into our temporal bodies; to eat the flesh of the Son is to be drawn into His own order, an immortal order nurtured in the womb of life until death gives us second birth from above, as Jesus said to Nicodemus. O bless’t communion the song goes, for we do not eat alone. Offering private Mass (none is strictly private, but might be unassisted by others) a priest knows he’s not alone by far. He invites ‘brothers and sisters’ to respond: all the angels and saints thronging to the eternal banquet, of which this sacrifice is an instant portal on earth, not merely a memorial re-enactment of events long past. The sacrifice is once for all, in which the divine has so vested Himself as to pierce both time and space. We ought not be stunned at a piercing of time and space, a threading of place or span. Just consider physical cosmology. Down to its tiniest scale, so-called quantum mechanics - a vastly successful describer of the fabric - is non-local. It actually embraces ghostly action-at- a- distance: if not instantaneous then at the speed of light. An electron (‘fermion’) can be - and feasibly is - dancing with another, far removed. If assumed to be unpartnered or disentangled it may not actually be, for its unbound correlate is not at likely to remain nearby. Chemical bonds can be treated as entanglements, which is also shown to link the action of one charge to the sudden state of a paired one afar off: a principle being applied to cryptography and reliable deep-space communication. Time also is thickly woven. A photon sent toward a slit or doubly slit screen goes as if ‘knowing’ whether a slit is alone or doubled. It’s informed as if a pilot had gone forth, sampled the vast ways and angles for arriving on the other side, and retrieved the facts, instantly. Passing a sole slit, it will expose a far film in one pattern; entering either of two slits it will paint a different one. If the screen is grated with minuscule sawteeth instead, it will diffract and self- interfere as if having guessed that too. The familiar observation of rays bending on entering water is explained as light taking the least time or action to get where it’s going. It does so likewise, being proactively informed by its environment. Getting informed involves time standing still, the result of a time-advanced and time- retarded aspect. Then again, at the extreme other scale, great streams of stars are consumed by a gravitational black hole, whose skin is a place where time has stopped progressing, or whose advance is not measurable. More galaxies are visible to a scanning telescope than the milky splash of stars in our own or in any of them, and most have such a core where time is arrested. You may guess this suspension is owed to the huge mass densities that curve space-time, but that’s not the only occasion. A photon free in open space, moving many light- years, spends no time of its own reckoning: in its moving frame time stops. As far as concerns it from the moment of existence, a photon gets to be everywhere it’s going to be at one instant of its proper time. In saying "let there be light” God might well have phrased it “let light be”. All this is a challenge to digest, framed by the words of a founder “whoever says they understand QM does not in the least”. But if basic physics is not to be understood yet believed because so often right and precise, we need to rethink what’s meant in naming any mystery an enigma. And why should He who made all of it, not be wrapped in mystery? Yet for all that, He makes himself palpable, ingestible, and delectable. Here at hand is the bread of Heaven .. containing in itself all sweetness. Be still my soul ! The sweet spot on a racket is where it’s still, despite the force of ball impact. A bat’s sweet-spot is least jarring for the batter, and most moving for the ball. A player calls stillness in the motion sweet because you can there ‘speak to’ or address the pinging ball or popping ski. Physicists also find something sweet when discussing motion, namely what remains still, quiet and invariant. A ‘constant of the motion’ or stationarity solves dynamics and gives implicit sense. It may be the path of least action (a stationarity), or constant energy, momentum, period and frequency of repeated motion, matched impedance (even the impedance of empty space), an oscillator’s Q (measure of signal strength and stability), or just the unchanged shape of a wave that passes, like a rogue soliton wave at sea or the flame of a candle. These images of sweetness indicate the experiential nature of that ‘still quiet voice’ we hear in God’s presence. The deep night’s silence in which Christ was born, or that announced Him to Elijah on the mountain or to Moses at the burning bush. Our souls and psyches harken, finding rest and assurance in what is still, dependable, and solid like the rock of Meribah whose sweats were sweet. If the rock is a figure of Christ, the suspended host is no figure but the reality: the sweetest, most stately, constant and abiding presence we can possibly find. Still O Lord, you say: “come away with me for a time and rest your soul”. The centre of all things, being their origin and keeper, rests here. The moral centre too, that calms the troubled soul. The mind’s centre, that gives space to and enlivens sleeping conscience: where God speaks unbidden so said John Henry Newman. The fulcrum of all meaning, the touchstone of all solving, the pirouette of all grace, the gravitational centre of all love, the pivot of all breath. In the end, only so much can be said of those attractors of existence: truth, beauty and goodness. They have to be experienced to be known; and that is the one key to being in God’s eucharistic presence. Much more than known, Truth is to believed; goodness loved more than admired; and with beauty to be enraptured more than enthralled. All of these are in the Person of the eucharist. Yours O Lord is the true beauty, all ancient, and ever new.